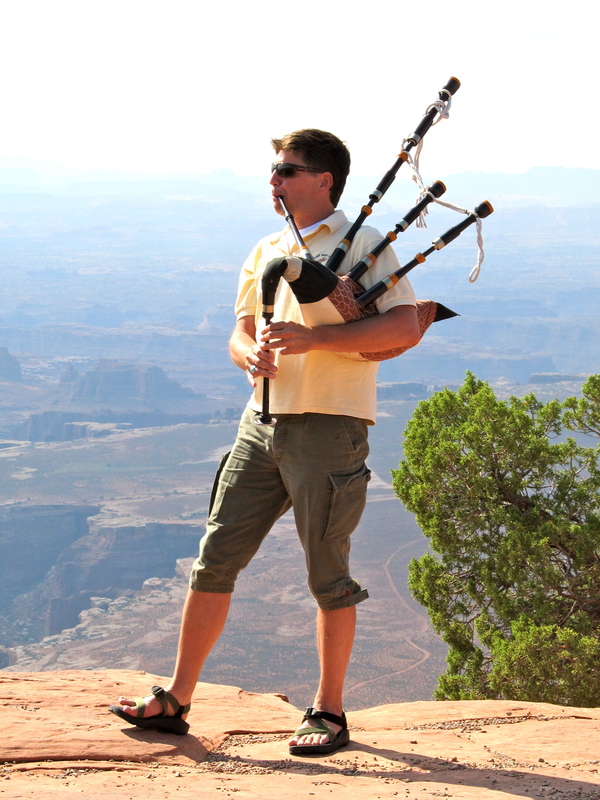 Christopher Layer playing the great highland pipes at Grand View Point. 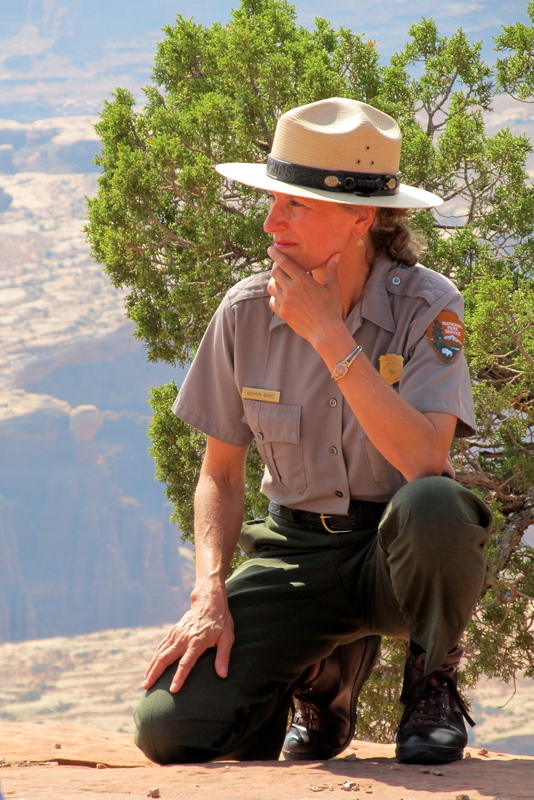 There I was at the Farmers’ Market in Moab, representing the National Park Service at a booth. Along came a musician, an artist-in-residence type, and BAM before you knew it a plan had arisen for him to provide live music for my geology talk the next week. Music is a wondrous metaphor. It serves well when words fall short. It connects both halves of the brain, helps build relationships in our minds, strengthens our understanding. Crossing language barriers, it stirs emotion and is a powerful tool in the work of interpretation. Ranger Kathryn, all ears, listening to bagpipe interpretation of geologic processes. But… musical geology??? YES. Great composers have written about magnificent formations (Grofe’, Grand Canyon Suite) or mountains (Mussorgsky, Night on Bald Mountain) or an entire solar system (Holst, The Planets). Surely Canyonlands National Park could provide the inspiration for improvised interludes of flute and bagpipe and Uilleann pipe music between the movements of my own geologic symphony. Improv keeps you on your toes and opens you to new ideas. The playlist that I use in my regular geology talk is comprised of classical music excerpts; this day it was whatever the musician was moved to play. I’ll let you try to imagine what lithification (process of turning sediment to rock) might sound like on the pipes. Thanks, Christopher Layer, for moving me out of my comfort zone and bringing your creativity to my Sunday ranger talk! Scrubbing graffiti off sandstone while it’s 95 degrees in the shade is challenging. At least it’s a dry heat. Spending the last two weeks on Graffiti Detail has deepened my passionate dislike of this stuff. Human nature wants to preserve a record of its presence in a place; graffiti is an ill-thought-out means of demonstrating that you were here. I’d venture to guess that the typical age of those who write on rocks (signs, trees, fences, etc) is 14-24 — well before their prefrontal cortex is fully developed and they can think through Cause & Effect more clearly. A few minutes of circular scrubbing with a brush, water, and a handful of sand can get light surface graffiti off of our soft sandstone. If it’s incised more deeply, like pocket-knife initials grooved into a boulder, it takes much more elbow grease and multiple attempts. The brush-smear that remains is a give-away that a thoughtless person left their mark there. You know, visitors photograph everything — including me removing graffiti, which always elicits a curious “What are you doing?” from folks wondering if I’m washing an arch. A splendid Teachable Moment ensues. My personal favorite: parents offering their youngsters for the removal efforts. Those children will never write on rock after working hard to restore it to its natural condition. 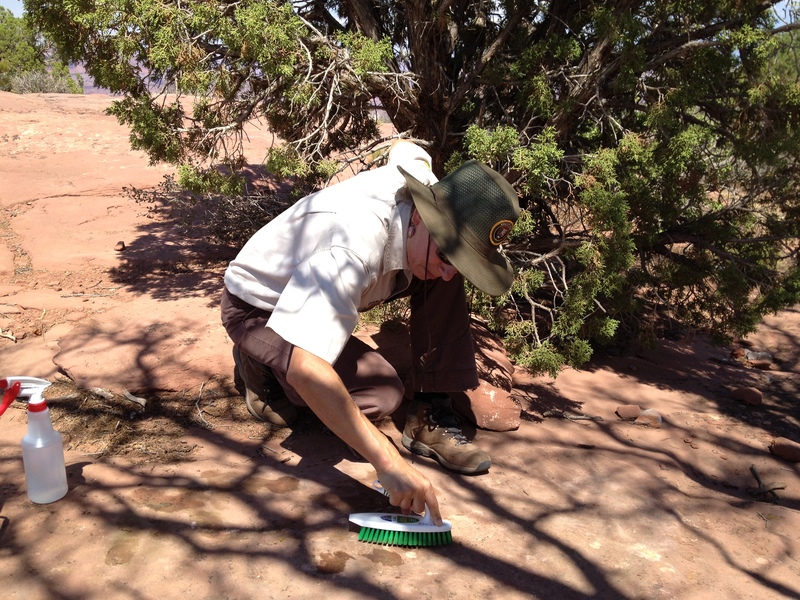 And, finally, in the category of “Imagine That”: previous graffiti-removal volunteers in national parks have inadvertently erased priceless historic signatures, so training is mandatory before one can tackle the curse of moderns leaving their marks behind. Please… don’t write on things in public! I’d much rather be interpreting the park’s beauty for visitors than remediating what’s been defaced. Today’s theme: The trip you set out on may not be the one you get. Wildfire smoke obscures our views lately in Canyonlands. This view is from the Green River Overlook. 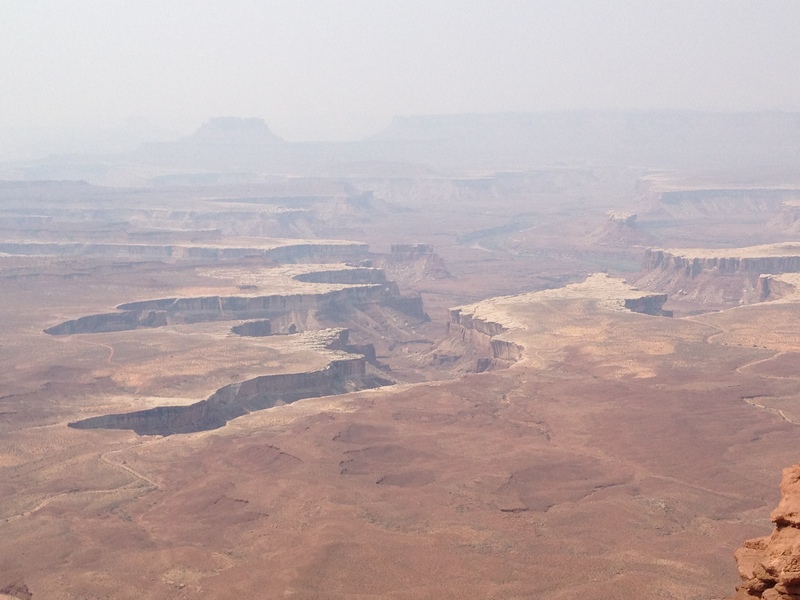 When you come to Canyonlands National Park expecting to see canyon vistas, thick smoke is not a welcome sight. I feel an unsettling disorientation because our nearby mountain ranges are completely invisible. Wildfires in Idaho and northern California are to blame, and the particulars of the wind currents are carrying smoke directly to us. Island in the Sky district of Canyonlands is visited primarily for its panoramic grandeur, but visibility yesterday was the poorest I’ve seen in three years. No relief is in sight until next week; we absorb visitors’ disappointment and apologize for natural phenomena with a shrug and a compassionate smile. The ambulance arrives from 36 miles away to transport an injured motorcycle rider. 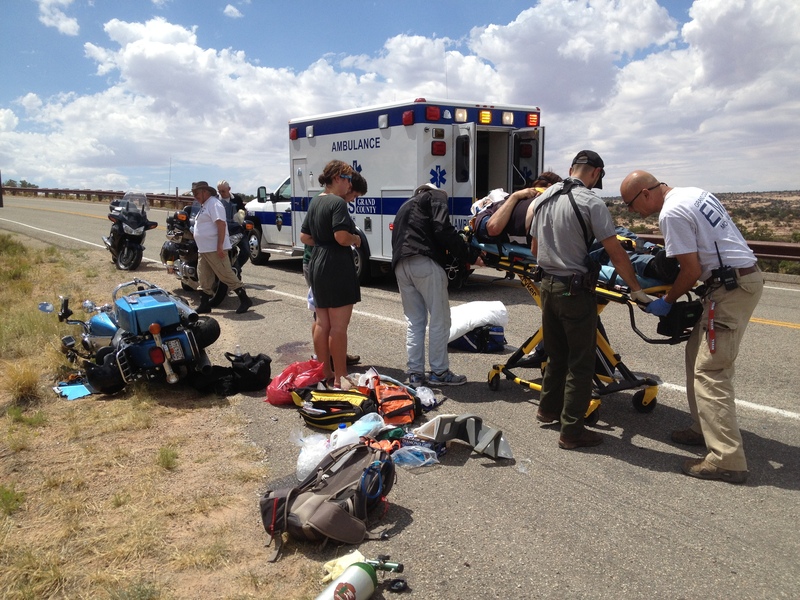 When your rented Harley T-bones a car, you downgrade to an ambulance ride and your 3-week tour around the great Southwest takes a disappointing twist. I got on scene minutes after this collision and the unfortunate rider had a 3.5-inch gash in his forehead that laid it open to the bone, in addition to a turkey-egg lump on his head and a broken clavicle. (Yes, he knows a helmet would have spared him the 43 stitches and the egg.) He’ll be returning home with permanent souvenirs of a trip that changed in an eye-blink. When a mule deer runs out in front of your rental car after sunset, and the legal 45 mph is too fast for you to stop, both its life and yours are changed in that moment. 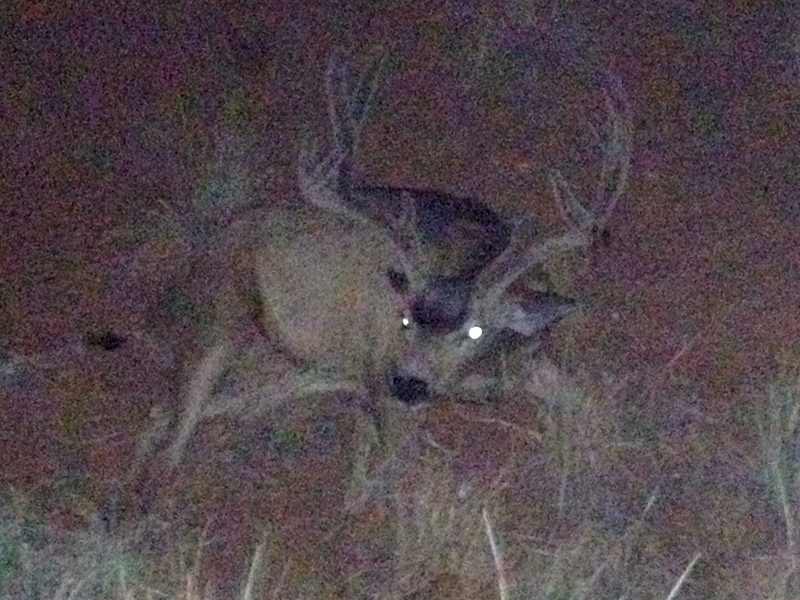 This poor fellow with velvety antlers had a couple broken legs and needed to be put down. Next day he was tossed over a huge cliff and left for a vulture feast. The visitors from Belgium were distressed, but unhurt. Leave a comment about a time your trip contained a surprise event that changed everything. In a roadside ditch, Mr Velvet’s last hour. 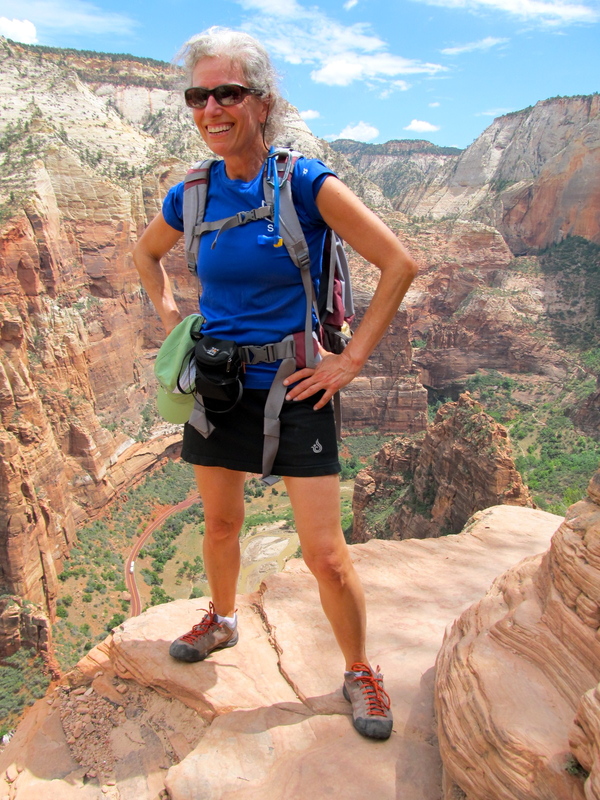 Four-fifths of the way up to the 1488-foot Angel’s Landing summit. White vehicle on canyon floor is the public shuttle bus. Every once in a while, the need for new scenery grows large and a three-day weekend affords a chance for an exotic getaway. Chris and I decided to head to Cedar Breaks National Monument, in the southwest corner of Utah, to explore a place new to us both. A month of daily rain contributed to a mudslide on our last road, however, requiring a route change; Zion National Park was an excellent fallback. 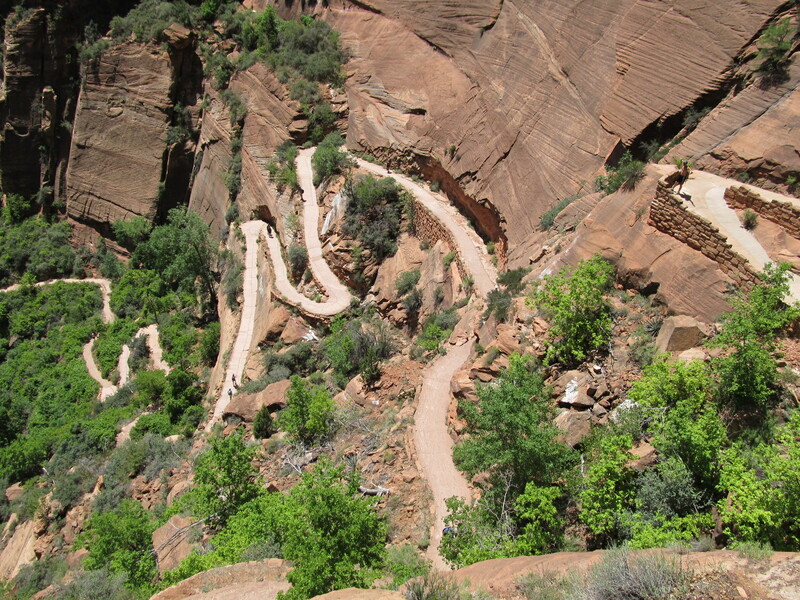 The switchbacks that take you up, up, interminably up to Angel’s Landing. If there is one iconic hike for which Zion is known, it’s the two-hour ascent to Angel’s Landing: up 21 tight switchbacks called “Walter’s Wiggles,” past the acrophobic dozens waiting on the safe side of the iron-chained portion of the route, then a perilous scramble along a skinny ridge that resembles the plates on a stegosaurus. Dizzying drop-offs on both sides (1200′ and 800′) plunge to the canyon floor in sheer verticality. Six fatalities have happened on this trail since 2004, which may be why there seems to be much more protective chain in place than the last time I hiked it in 1996. 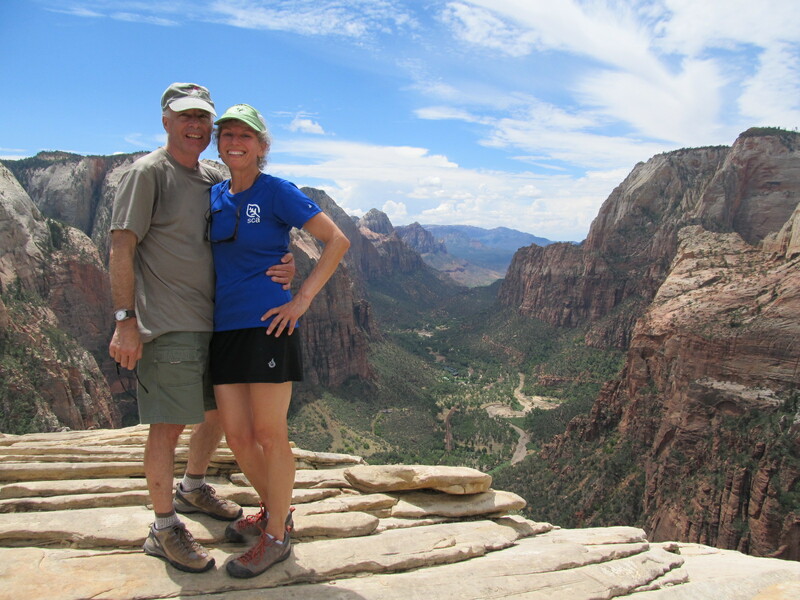 One works hard to earn the summit and its incomparable views of the entire Zion Canyon. The sweet flute-like song of a Canyon Wren will often lure you up the path, parts of which (Refrigerator Canyon) are pleasantly shaded in the morning hours. Summit views, incredibly beautiful, reward intrepid hikers who reach the final landing. Angels indeed might touch the earth here, but today it was an assortment of sweaty happy individuals who kindly took each other’s photo and beat a hasty retreat before approaching monsoons got any closer. This hike is one of the most famous in the entire national park system; I hope you’ll leave a comment if you have any first-hand memories of it.